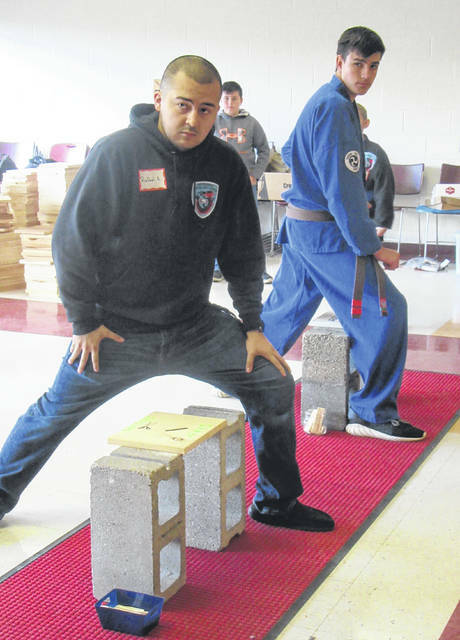 Martial Arts students and instructors from Bitanga’s Martial Arts Center in Middleport broke hundreds of boards this weekend to raise money for the Meigs County Council on Aging’s Auditorium renovation. ROCKSPRINGS — Hundreds of boards were broken on Saturday as part of the second Bitanga’s Break-a-thon to benefit the Meigs County Council on Aging. The event — which also included a craft show, raffle items and more — raised a total of $18,669.55, all of which will got to the Council on Aging for the renovation of the auditorium in the agency’s future home in Middleport. “On Saturday, Nov. 3rd, hundreds of people came together to paint a perfect picture of the vision we all speak of. Where people of all ages had fun together and worked towards a noble cause without having to identify what makes them different from each other. In doing so they raised over $18,000,” said Bitanga’s owner Ben Nease in a statement read as part of the Council on Aging Giving Thanks reception on Thursday. “This kind of connectivity is an essential element that most communities around our country are in need of today. For this reason, Bitanga’s Martial Arts Center proudly continues to support the vision,” concluded the statement from Nease. Since Saturday, that total has grown, now reaching $20,000 thanks to a challenge from local businesswoman Paige Cleek. Cleek challenged local businesses and individuals to contribute $100 each in order to bring the total over $20,000. Thanks to the support of those additional businesses and individuals the $20,000 goal was hit on Wednesday night, said Nease. This is the second year for the Break-a-thon, with the funds raised last year also benefiting the restoration of the former school building. One of the most popular parts for those in attendance on Saturday was for the non-karate students to take turns learning to break boards. Even State Rep. Jay Edwards got in on the board breaking, said Nease. Nease said there would be an arena set up for individuals to learn to break boards again next year. While there were raffle items, the favorite auction item of the day was a gourmet cheesecake made and donated by Anita Hajivandi which brought $225 at auction. Planning is already taking place for Bitanga’s Break-a-thon 3 to be held next fall at the new Senior Center in Middleport. The craft show will continue to be part of the event. The recipient of the funds from the third event has not yet been selected, said Nease, with the decision to be made closer to the event. A fall festival may also take place in the front lawn of the senior center in conjunction with the craft show and break-a-thon inside the building. 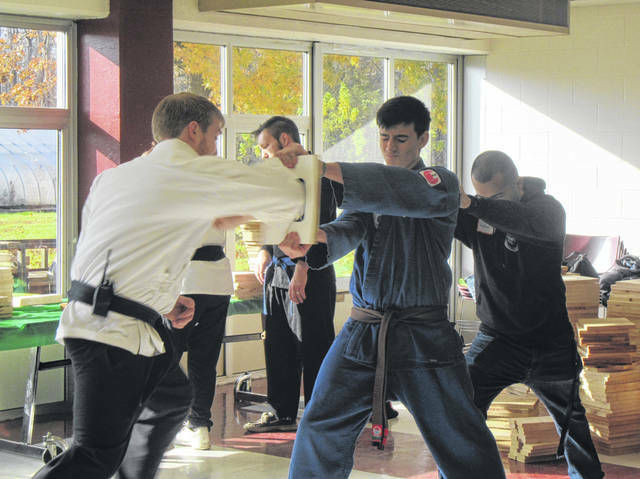 https://www.mydailysentinel.com/wp-content/uploads/sites/14/2018/11/web1_11.6-Karate-1_ne201811515263374.jpgMartial Arts students and instructors from Bitanga’s Martial Arts Center in Middleport broke hundreds of boards this weekend to raise money for the Meigs County Council on Aging’s Auditorium renovation. https://www.mydailysentinel.com/wp-content/uploads/sites/14/2018/11/web1_11.6-Karate-2_ne2018115152637248.jpgMartial Arts students and instructors from Bitanga’s Martial Arts Center in Middleport broke hundreds of boards this weekend to raise money for the Meigs County Council on Aging’s Auditorium renovation.